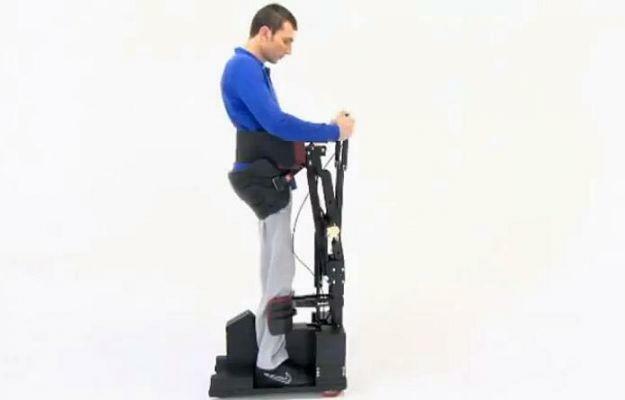 A team of scientists based in Istanbul, Turkey have created a revolutionary piece of equipment for those with spinal cord injuries and illnesses that provides a level of independence far beyond that which is available to users of conventional wheelchairs. AMS Mekatronic’s Tek Robotic Mobilization Device (RMD) helps users to stand without another person’s help, enabling them to comfortably perform tasks about the home, office or shopping mall, and to engage in eye-level conversations with people around them. The RMD’s main platform is on wheels — it looks rather like a Segway — allowing the user to move around as they would in a wheelchair. The RMD, however, affords much more versatility and freedom than a conventional wheelchair, as it is only 36cm wide and 62cm long, covering about a third of the space of a regular wheelchair. In a video on AMS Mekatronic’s website, Hurriyet Yilmaz, an associate professor at Halic University in Istanbul and a specialist in physical medicine and rehabilitation, explained how those paralysed by spinal cord injuries or illnesses often have to deal with spending much of their life (if not all) in a wheelchair. AMS Mekatronic also lists a number of advantages of the RMD over conventional wheelchairs. For example, it can be comfortably and safely mounted from the back — unlike wheelchairs where users have to twist and virtually throw themselves into the wheelchair from a bed or other location. The robotic device works as an exercise machine too — paraplegics need to engage in daily exercise in order to maintain their health, but existing machines are mostly bulky and awkward to use. The RMD incorporates a suspension system that utilizes a gas spring, enabling the user to move into a sitting or standing position without too much effort. It also enables users to function hands-free while upright, giving them the ability to perform many more tasks than if they were standing with the aid of some other form of support. The RMD, which comes with a price tag of around $15,000, goes on sale in Turkey this week. Meanwhile the company is still looking for distributors in the US and Europe.